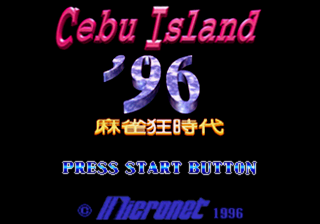 Mahjong Kyou Jidai: Cebu Island '96 (麻雀狂時代 セブアイランド'９６) is a mahjong game developed and published by Micronet for the Sega Saturn. The game features live-action footage of women on the Phillipine island of Cebu. Main article: Mahjong Kyou Jidai: Cebu Island '96/Magazine articles. CEBUABS.TXT TXT (Abstract) 229 About this game. CEBUMK.TXT TXT 484 Messages from the developers. Note:BIB and CPY are same content in 2 discs.